A GOOD REASON TO AVOID COCONUT OIL: "DID AN ABUSED MONKEY PICK YOUR COCONUT?" See this page for how to find cruelty-free coconut products. No reproduction of the following material without permission from the author. You may wonder why a food writer like me, who advocates very moderate use of fat in the diet, would take the time to develop a full-fat homemade vegan buttery spread. In 2011 (was it really that long ago?) a woman whom I have admired from afar for years wrote to me. Her name is Kay Bushnell and I read her vegan cooking column, Cooking Green, in the Loma Prietan Sierra Club Newsletter (sadly, her column is no more) for years. Kay asked me if there was an alternative to vegan margarine utilizing palm oil and outlined the reasons why she was asking. I’m ashamed to admit that it took me so long to act on what Kay was telling me. However, I never forgot about what Kay told me, or her request. When 2012 arrived, with my new book finally launched, I decided that this would be my first project for the New Year, and I wrote to Kay to let her know that I was committing to developing an alternative product. She signed on as a tester, and I later recruited a few more. I worked on this recipe from the beginning of January 2012 until the end of march 2012. I wanted it to look and taste and behave much like dairy butter. I wanted to be able to use it in baking. I wanted it to be easy and quick to make, with minimal equipment required. I wanted it to cost no more than the most popular vegan margarine. I wanted options to make it with organic and even fair trade ingredient. And I wanted—no, required-- it to have a healthy balance of saturated, monounsaturated and polyunsaturated fats, with the monounsaturated fat playing the starring role—and that meant that my recipe would NOT be coconut oil-based. I’m happy to say that I succeeded on all counts! Cocoa butter (organic fair trade, if you can manage it) mixed with vegetable oil high in monounsaturated fat proved to be the answer, along with a few other simple ingredients. (You can read about the qualities of cocoa butter in the material below.) I tested it in vegan icing, pie crust, cake, scones and biscuits, with no problems at all. Early on, Erik Marcus of vegan.com provided me with a platform larger than my own to introduce my recipe to the vegan community. However, I have made improvements and a "tub" variation over the last 6 years, which is why I am posting the updated recipe on this page.) Though the recipe itself is simple and quick to make, you’ll have greater success with it if you read the information I have compiled right here at this post (below) concerning ingredients, molds and equipment, where to purchase them, nutrition, and fat breakdown. ***Also, at the end of this post is important material on the palm oil question and the threat to orangutans. So, good readers, before you start, please read the following important info on this page. And, again, this link contains the recipe and all the info on this page, in printable format. Important Note: Only the weight of the cocoa butter is given in the recipe, for the simple reason that my testers and I discovered through trial and error that 3.85 oz./109 g of some brands of cocoa butter measures out to 1 cup when melted, but other brands measure out to less than that. After some experimenting, we came to the conclusion that it is the weight of the cocoa butter that is the essential measurement, so the best practice is to weigh it accurately before melting. PS: Stand-alone Printable Copy of the "tub version" only of my Buttah recipe. MY RECIPE FOR PALM-OIL-FREE "RAINFOREST SHORTENING". © Bryanna Clark Grogan 2017. All rights reserved. NOTE #1: It saves time and effort if you make double or triple the recipe at one time and freeze most of it (double-bagged). The Buttah will keep in the refrigerator for 2-3 weeks. I advise freezing whatever you won't use in that amount of time. Note #2: FOR A "TUB VERSION" OF BUTTAH, all you do is follow the basic recipe, but increase the oil to 1 1/4 cups and reduce the amount of cocoa butter to 81.6 g (2.88 ounces). 2.) An immersion/stick blender. I recommend that you use this type of hand blender rather than a countertop blender- clean-up is easier and the Buttah emulsifies more easily; plus you have better control over the process. I have a cheap little immersion blender and it works just fine. 3.) A digital kitchen scale that shows ounces and grams is essential for this recipe, and you will find it useful for many recipes and kitchen chores. There are several excellent, inexpensive versions on the market. 4.) Measuring cups and spoons; silicone spatulas, small, medium, large; medium whisk. In the 2-quart Pyrex batter bowl, whisk together the non-dairy milk, lemon juice and salt. Add the liquid lecithin, but do not whisk. (To measure out the lecithin, oil the 1-teaspoon measuring spoon and the lecithin should easily slide out of the spoon.). Set this mixture aside. To melt the cocoa butter- #1, my preferred method: place it in your 1-quart Pyrex measuring cup and melt it in a microwave oven. I timed the melting of the cocoa butter and it took about 3 minutes at 50% power in a 1200 watt oven. (Don’t use 100% power-- it will get too hot.) If it isn't completely melted, stir it a bit until it melts, or give it a few seconds more. Add the liquid oil, but do not whisk. Add the guar or xanthan gum to the milk mixture in the 2-quart batter bowl, but don't stir. Now, pour the melted cocoa butter/oil into the milk mixture in the 2-quart batter bowl and immediately blend with an immersion/stick blender for a couple of minutes. When it is thick and creamy, STOP! It is emulsified. Immediately distribute the mixture evenly into the 6 silicone cupcake liners, or whatever molds you are using. I place my molds into round cake pans so that they are easier to transport to the freezer without spilling. Place the molds in the freezer for about 1 hour, checking after 10 or 15 minutes. Do not omit this step because you want the mixture to solidify quickly. **IMPORTANT NOTE: If your Buttah seems to separate at this point or in the early stages of freezing, DON'T WORRY-- simply stir each mold of Buttah mixture briefly with a mini-whisk before placing in the freezer. Then whisk it again every 10 minutes or so for about 30 minutes, or until it starts to firm up and look creamier. 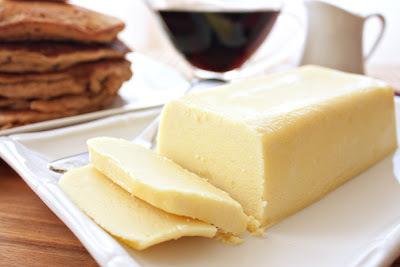 When the Buttah is solid and can be released from the liners or molds, wrap and bag it, or place in a covered butter dish, and freeze or refrigerate. It will keep refrigerated for 2-3 weeks, and you can keep it well-wrapped and frozen for several months. Refrigerated, it will stay solid at room temperature after freezing and thawing for some time, so it’s safe to put it on the dinner table, but it is best kept refrigerated most of the time after thawing. It is spreadable even when cold. NOTE: It saves time and effort if you make double or triple the recipe at one time and freeze most of it (double-wrapped)-- it doesn't keep as long in the refrigerator as real butter or margarine. The Buttah pops out of silicone molds easily. 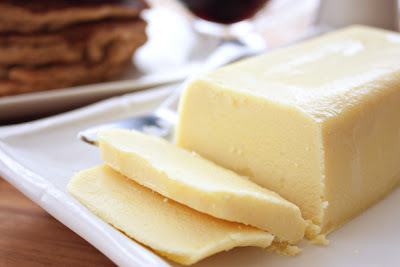 With glass or plastic molds or containers, if you want to unmold the Buttah rather than use it straight from the container in which it was chilled, you must dip the bottom of the mold into a bowl of very hot water for a few seconds and then hope it will slide out without melting the product too much! A good mold for Buttah is the Tovolo King silicone ice cube tray that makes approximately 1/2-cup-square-cubes (the recipe will fill 4 1/2 of the 6 cubes). Another is the Wilton Easy Flex Silicone Four Cavity Mini Loaf Pan. Or use 4 large silicone muffin cup liners. If you prefer small portions, use 6 medium-sized silicone muffin cup liners, or 12 mini silicone muffin cup liners. Another possibility might be this 12-cavity silicone dessert bar pan. Or you can use a muffin pan with medium cups, lined with baking parchment "tulip" baking cup liners (which you can fold over the top once they're set, and store like that in a storage container or zipper-lock bag); or baking parchment baking cup liners, large, medium or mini in the appropriate-sized muffin pan. I can't give you an exact amount, as it's hard to figure out the cost of 2 tsp. lecithin, 1/2 tsp. guar gum, 1/8 tsp. turmeric, and 1/2 tsp of lemon juice (can't be much for those things! ), but calculating cost using deodorized organic, fair trade cocoa butter at $13 lb. (to include shipping) from Chocolate Alchemy (see below), and organic oil at about 32 cents a fluid ounce (going by prices when purchased in larger amounts online) this recipe (a bit over over a lb.) would cost under $6. (If you use non-deodorized organic fair trade cocoa butter it can be as low as $3.75 for the recipe. To compare, organic butter is over $7.00 per lb. where I live and (non-organic) Earth Balance, in my town or online in Canada, is between $5.49 and over $6. So, I'm happy with what it costs me to make, especially considering how easy it is to make. (If you don’t care about using organic oil and lecithin, it will be cheaper, of course.) Canadian and US dollars go up and down, so this is sort of a combination of both. If you belong to a food coop, you can save on the cost many of the ingredients (and perhaps share cases with friends). WHY USE FAIR TRADE COCOA BUTTER? I was taken aback when, some years ago, I learned that much of the world's chocolate was produced not only by very underpaid and badly-treated workers in Africa, but by children in virtual slavery. For me to have my chocolate hit? No, no, no! 1.) Cote d'Ivoire (Ivory Coast) farms produce nearly half the world's cocoa (and 75 % of North America's chocolate), most of which is used by major corporations like Hershey, M&M/Mars, and Nestle. 2.) About 90 percent of Ivory Coast cocoa plantations used slave labour when the BBC documentary "Slavery" was made. Most are young men and boys from impoverished areas in Benin, Togo and Mali. They are enticed by traffickers who promise them (or their parents) paid work, housing and an education. Instead, they are sold to Ivory Coast cocoa plantation owners who beat them into submission and offer no pay for gruelling, 18-hour days. International recommends: "In the absence of industry action, the only way consumers can be confident the produce they use is free from exploited labour is by buying products which carry a fair trade label. Cheap chocolate is probably slavery chocolate and cocoa butter comes from chocolate. It's a luxury, so let's be prepared to pay fair prices for fair trade. This applies not only to the chocolate and cocoa we eat and cook and bake with, but to cocoa butter and cocoa butter products, including cosmetics and toiletries. I discovered that all deodorized cocoa butter is steam-deodorized, and NOT deodorized with chemicals. (Here is an article explaining the process of deodorizing cocoa butter.) Deodorized cocoa butter does not taste or smell like chocolate, so that is the one most of my tasters and testers preferred in Buttah. However, some of us liked it quite well with either one, so I have listed places to buy both kinds. I’ve been buying my deodorized organic, fair trade cocoa butter from the Eugene, Oregon-based vendor , Chocolate Alchemy. When you order 8 lbs. at a time (order 5 lbs, 2 lbs, and 1 lb together), it comes to a little over $13 lb. because the shipping is the same price for 8 lbs. as it is for 1 lb. (1 lb) $10 to $12, plus shipping. Also available in 5 or 10 lb weights. NOTE: Food grade organic cocoa butter, lecithin, and oils are often available online from organic soap and cosmetic suppliers. You can use ordinary supermarket canola oil, but High-Heat Canola, High Oleic (High-Heat) Safflower Oil or High Oleic (High-Heat) Sunflower Oil contain the most monounsaturated fats of common cooking oils. See the Spectrum Organics page on oils and click on the details for each oil you're interested in. Most North American health food stores and supermarkets carry Spectrum Organics oils. But some of these oils (not necessarily Spectrum brand) may be available online in larger quantities than in health food stores and supermarkets, and therefore lower prices, or you may be able to purchase them through a food coop for less. Olive oil is one of my favorite oils and is high in monounsaturated fat. But it also has a distinctive taste that I don’t like in this recipe. There are other oils high in monounsaturated oils that would be tasty in this recipe and you are welcome to use them if you can afford them: including hazelnut oil, avocado oil, and almond oil. WHY USE OILS HIGH IN MONOUNSATURATED FAT? I wanted my spread to be low in saturated fat and useful both as a spread and in cooking and baking, which is why I recommend the oils that I do. I don’t have the space to elaborate much on this issue, but here are a few words of wisdom from two vegan registered dietitians. 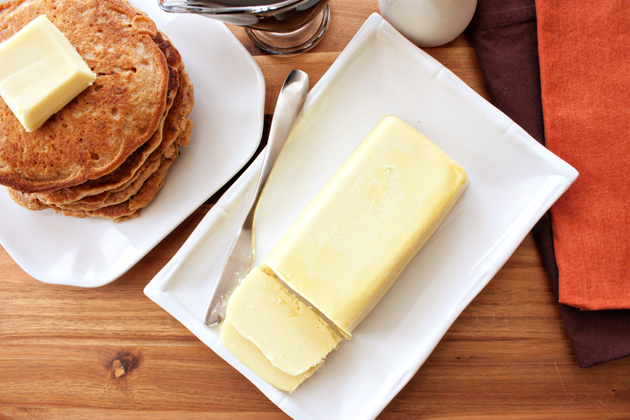 Butter, palm oil, and coconut oil are high in saturated fats. Contrary to what you might have read on the internet, these fats do not contain any magical nutrients or qualities, and even if they did, I would regard them as a poor way to ingest them because fats are primarily just…fat, and, like sugars (natural or otherwise), contain only trace amounts nutrients. There are better ways to get your nutrition. Some oils high in polyunsaturated fats and therefore unstable at high heats, such as flax, borage, etc., do contain essential omega-3 fatty acids, but they are best used uncooked or in foods cooked at low heat. “…olive oil, organic canola oil, and high oleic sunflower or safflower oil that contain mostly monounsaturated fats are more stable when heated and are your best choice for cooking and baking.” Brenda Davis, RD Oils high in polyunsaturated fats, however, are not so heat-stable and can be damaged in cooking. I could only find the following bargains online—you might find more with a little more digging than I had time for. Nutrition (per Tbsp): 84 calories; 9.5g total fat; Saturated Fat 2.45g; Monounsaturated Fat 6.10g; Polyunsaturated Fat 0.47g; 0.0mg cholesterol; 54mg sodium; 3.7mg potassium; 0.2g carbohydrates; 0.1g fiber; 0.1g sugar; 0.1g net carbs; 0.1g protein; 2.5 points. I used Living Cookbook Software, and consulted the USDA Nutrient Database, for nutrition facts. XANTHAN GUM OR GUAR GUM? Xanthan gum is quite a bit more expensive than guar gum, and is also corn-based, for those who may be concerned about that. Health food stores usually sell these vegetable gums in the allergy foods section, and they can be ordered online easily. I have found that, for most purposes, guar gum works as well as xanthan gum. “I am writing to share my concerns about palm oil and to hope that you might consider using a palm oil-free shortening or margarine in its place. You have outstanding recipes and have a lot of influence with vegans, who are generally assumed to be sensitive to animal suffering and environmental degradation. At the same time, we vegan cooks want to use fats that make the lightest, tastiest possible baked goods. Unfortunately, everything I have read indicates that there is no guarantee that any palm oil is sustainably produced at this time. There is no widely used accreditation agency that rigorously investigates palm oil production. “The suffering of the orangutans and other wildlife due to palm oil production is heartbreaking. Orangutans and at least 3 other native mammals are expected to go extinct this century due to habitat loss and being killed due to the expansion of oil palm plantations. One can view the suffering orangutans in the startling images of Sean Whyte of the Center for Orangutan Protection at http://naturealert.blogspot.com. Even though palm oil is not an animal product itself, it causes the death and suffering of vulnerable animals. They are caught in the midst of rampant profiteering from palm oil production in countries where officials who could protect them often have ties to the palm oil industry. In the end, when the palm oil boom is over the animals will likely be gone.” You can read more about the issue here. Unfortunately, when there is such a huge market for a product coming from third world countries, it’s difficult to know if it is truly sustainable. Kudos to the fair trade activists who have worked so hard with chocolate producers so that we can obtain fair trade cocoa butter! Looking for information, I found smear tactics going on against such organizations as The Palm Oil Truth Foundation. 1.) No footnotes, just put-downs of Green Peace, etc. ; 2.) The author writes: "My nutrition and health views follow those of The Weston A. Price Foundation and Real Milk.com. "; 3.) some purple prose here, and some competing evidence here; 4.) and this from the WAP Foundation itself. I'm afraid that I’m suspicious of the motives of the above groups. In defence of the exploding oil palm industry, most of these articles parrot the "look at the soy and corn that is being grown in deforested areas" line, with no mention that these crops are grown primarily for feeding livestock and for biofuel (as is palm oil, and the palm refuse, I have just learned, is also used feed to livestock). conservation groups would make this up-- they have no monetary interest. If you are concerned with the issues very briefly outlined above (more links below), I hope that this recipe will help you to break the palm oil habit. But let’s keep writing to our favorite vegan companies to ask them to consider other ingredients and other formulas for not only margarine, but other commercial foods as well. "Unilever is the world's biggest buyer of palm oil with a yearly consumption of 1.3 billion tons and has been associated with rain forest destruction in the last years in Indonesia through their palm oil suppliers. One of them, Wilmar International, operating 600.000 hectares of palm oil plantations on Sumatra and Borneo, is well-known for illegal rain forest destruction and violation of human rights. Boycott Unilever!" The new Greenpeace report, "Caught Red-Handed: How Nestlé Use of Palm Oil is Destroying Rainforests and the Climate" exposes how Nestlé is sourcing palm oil from suppliers, which continue to expand into virgin rainforests and carbon-rich peat lands, including habitat critical for endangered orangutans. Nestlé suppliers include the controversial Sinar Mas group, Indonesia’s largest producer of palm oil. Nestlé is using palm oil from destroyed Indonesian rainforests and peat lands in popular products like Nestlé Crunch, CoffeeMate, and PowerBar. Nestlé, the world’s leading food and drink company, is a major consumer of palm oil. In the last three years, its annual use has almost doubled, with 320,000 tons of palm oil going into a range of products, including some of its most popular brands. Send email: Give the orang-utan a break. Watch the video Have a break? from Greenpeace UK on Vimeo. "Most of palm-oil’s allure to companies is undeniably its extreme versatility. It can be transformed into over 200 different ingredients, all with various functions and benefits. In fact, in today's market 'about 60% of palm-oil consumed globally is in the form of derivatives.' In our experience, these ingredients are the main source of frustration for those who want to avoid conflict palm. We encounter a lot of disbelief from consumers who read ingredients lists and feel duped by glycerin or sodium lauryl sulfate. We also get messages of total exasperation: "I have to cross-reference this list every time I shop?" "
Thank you for your patience in waiting for the recipe and in wading through the information. I sincerely hope that you enjoy making and using Buttah! Awesome! Thank you so much for this info! The Buttah is here!! I am blown away by your research capabilities and incredible food knowledge. You are both a scientist and an artist...and generous to boot. This Buttah is truly divine and healthy. Kudos Bryanna!! Thank you so much for your continuing research and work on all things vegan. This post was amazingly well documented, for which I thank you. I am sharing this information with my vegan meetup group. Thank you, Bryanna, for all the thought and care that went into creating the recipe, and for sharing the links and work that influenced your ingredient choices. You're so very welcome, Bryanna! Thank YOU for this amazing recipe! Honestly, the Buttah turned out so well on the first try because you have perfected the recipe to a science! Hi! I'm so excited to try this! I've made Mattie's version and while it is great it's a little too hard for spreading. One question - is the lecithin required? We can do soy nor sunflower due to my sons allergies. Is there a sub I can use? Thanks in advance! You're so welcome, Bryanna! Thank YOU for this amazing recipe! Honestly, the Buttah turned out so well on the first try because you have perfected this recipe to a science! Thank you so much for sharing this recipe. I can't wait to try it! Sarah, I think the lecithin definitely helps the product. Did you use it in Mattie's version? Also, could you ask your doctor if that tiny bit of lecithin in a product you don't eat gobs of would hurt your son? Technically, lecithin is a fatty acid and may not contain the substances in the plants that cause the problem. It's worth asking, anyway. "Lecithin is a lipid, or fatty substance, found in all living cells, especially cell membranes, composed of natural, nutritive phosphorus-containing biochemicals." I should have noted that lecithin is present and can be obtained from other foods (natural sources of lecithin also include canola, egg yolk, wheat germ, legumes, yeast, peanuts and wheat germ, among others). So, again, perhaps lecithin from soy or sunflower would not be a problem. Also, you could inform your doctor that 2 tsp. of lecithin is distributed (in the recipe) through 108 tsp. of the Buttah, so it is a minute amount. Oh boy. First, thanks for this recipe, Bryanna. Of course I JUST bought a 45 oz. tub of Earth Balance a few days ago, and it will take a long time for me to go through that. And it will probably be the last, unless Earth Balance comes up with a new formula. I went to the link you provided for the Melrose spread, and will write to Earth Balance to let them know I will be suspending purchase until the formula changes, or they are able to guarantee a non-destructive source for palm oil (will share the Melrose link with them also). In the meantime, home-made will work just fine! Thanks, Carolyn! But, I have found that, even with shipping, to Canada, making Buttah with the Chocolate Alchemy (see my ingredient resources) deodorized organic, fair trade cocoa butter keeps the cost about the same as Earth Balance. And, since it can be mixed successfully with much more oil that the other recipe, the fat breakdown is much healthier. Thanks so much for your response! Unfortunately he has reacted to both soy and sunflower lecithins :( I didn't use them when I made Mattie's version but wondered if that was why the butter wasn't spreadable. If they were for emulsifying, I found that I had no problem without them - the water/oil never separated. I'm going to give this a try with my regular cocoa butter before I order the deodorized cocoa - while I live chocolate, sometimes I would prefer a savory spread! Thanks again! I'm so excited the recipe is finally out! I've been eagerly anticipating this since you first mentioned it a few months back. I'm hoping you will decide to sell this in stores or work with someone who wants to make that happen, so that the less kitchen ambitious have access to a trans fat and palm oil free option (that doesn't taste like coconut). Thanks for the info on non-fair trade chocolate, I'm really glad to know that and will be buying fair trade exclusively in the future. This is truly fantastic, and I can't wait to make my first batch! About the milk...I make my own soy milk and I really try to avoid buying packages from the store. Is it possible to just add sugar to the recipe? ILorelei, I make my own soymilk, too, and I add 2 tablespoons organic sugar and 3/8-1/2 tsp. salt to each batch (of 1 1/2 qts.). This comes to 3 g sugar per cup. Dairy milk contains contains 12 g! (Sodium is about the same). So, if you don't add it to the milk itself, you could add 1/2 tsp. unbleached sugar to the recipe. Hi Bryanna, thanks so much for this recipe and all of the fantastic info on your site! Right now I have coconut oil and would have to wait for shipment of cocoa butter but would like to make this ASAP rather than buy more Earth Balance. Could I make your recipe with the same measure of coconut? Or, should I just try the other recipe for the time being? Thanks, KateM! I don't think it would be firm enough with coconut oil. The coconut oil is softer than cocoa butter to start with, and the cocoa butter has pretty amazing qualities of firming! Wow - I just made this without lecithin and it turned out wonderfully! I'm so excited how this is actually spreadable at room temp! I used hemp milk and regular cocoa butter but now I'm off to order deodorized cocoa! Thanks for this recipe and for all of the info! Hi, I have a couple of questions. First, I don't own an immersion blender and I don't really have many uses for one since I have a Vitamix. So, can this be blended in my Vitamix at the lower speeds? Second, has anyone tested Buttah in a "buttercream" frosting recipe? I think before I experiment with another vegan butter that I have to lay out some cash to make, I'd like to know if it makes good frosting. Thanks! Anonymous, yes, you can use a Vitamix at low speed, but watch it carefully and stop it as soon as it gets thick and emulsified (though, as I tell you in the recipe, you can still save it if it "breaks"). I just recommend using an immersion blender if you have one because it works well and is easy to clean-- and also because, if you have no blender of any kind, it's the cheapest to buy. It works perfectly in buttercream! Hi Bryanna! thank you so much for this recipe. I can't wait to try this. I have two questions for you. Until I can get deodorized cocoa butter, I have on hand raw cacao butter. Can I use this as an alternative? My second question is about soy lecithin. I have a large quantity of soy lecithin granules. Do you recommend using this as a substitute for the liquid until I deplete this stash? If I can substitute it, what would be the measurement? thank you again.! I am a long-time fan of yours!! Your generosity and talent are seriously appreciated in my family!! Hi, Lesley! Yes, you can use raw cocoa butter, but be aware that it will have a chocolate aroma and slight taste, which some people don't like in this recipe. You can use 2 1/4 tsp. lecithin granules instead of the liquid, but I found it inconsistent in quality. Mix it in with the hot melted cocoa butter before adding everything else. Thank you for posting this recipe. I have great resources to obtain the ingredients involved. I'm excited to try this, and hope to report back with success. The political/ecological information is invaluable. I wonder about cocont oil as well? This is what happens when compassion meets innovation! I use to make pie crusts from Crisco, but stopped b/c it contains palm oil. PO is even in Spectrum's shortening, altho they claim from "sustainable" sources. My pet peeve is a good pie crust - the really dry, flaky, melt-in-your-mouth kind (usually made from either shortening or lard, neither of which I use). Any idea the nature of pie crust made w/Buttah? I suppose there's really only one way to find out! Thank you. Hi Bryanna ... I just made up my first batch of Buttah and cannot get over how quick and easy it is to mix up!! One question: my batch emulsified almost immediately ... like within a second or two of turning on my immersion blender. But you talked about blending it for "a couple of minutes". I was afraid of overbeating it, but I did blend it for maybe 45 seconds or so. Does it become thicker as you blend it? When I stopped blending, it was thick and opaque, with a consistency of a smoothie. Anyway, I just took it out of the freezer and wrapped up the 3 pieces I made, so I guess it is fine!! I'm going to make up some cornbread and try this out!! But what I tasted when I licked my fingers had a great taste! Great work Bryanna! I love how you used deodorized cocoa butter due to its beneficial ratio of monounsaturated fats to saturated fats. It's interesting to see that you can achieve a good texture with a smaller amount of cocoa butter too. The fat analysis of various vegan butters including mine is also fascinating! I can't wait to try your version! Mattie, I'm so honored that you commented here! Thank you so much for all your wonderful research!! Hi! I just wondered if the recipe changed...I made this a few weeks ago and I could have swore it said about 1 cup melted cocoa butter (last time 109g wasn't enough so I had to add more to make the 1 cup melted). I just tried this recipe again and the consistency is much different (I used 109g and it made about 1/2 cup melted). Like a pp, it's like a smoothie. I'm eager to see how it is after freezing! I was hoping you could help me feel like I'm not crazy for thinking I needed the 1 cup melted! Thx! Sarah, It did change-- see Important Note at the top of the page. That's because I've discovered, from others and for myself when making this at my cousin's house, that the cup measurement varies. I don't understand how 109 g came to 1/2 cup melted. It has come to 1 cup at home, and 3/4 cup at my cousin's house, but we just went with that-- didn't melt any more cocoa butter-- and it worked perfectly. So I have concluded (and a professional chef agrees with me) that it's the weight that matters. Let me know how it works after freezing, please! Thanks for your response yet again! I don't know how I missed the note! So sorry that I should have looked at the top of the page! It came out of the freezer just fine - it was much softer than my first batch, but I guess that's obvious since I was using double the amount of cocoa butter! I think my last batch was harder like butter, whereas this is more like margarine, which I think might make a softer buttercream which would be great. I might make the harder version for crumbles or sugar cookies. I'm just happy to know that this latest batch is in fact how it's supposed to be! Thanks so much again! Sarah, I'm so glad it worked! BTW, are you sure that your scale is reliable? Just a thought. Also, did you see this in the recipe? "If for some reason you blended too long and the emulsified mixture “broke” (became liquid-y, as shown in the photo below), it’s okay—you can save it: stir each mold or container of Buttah mixture briefly with a mini-whisk before placing in the freezer. Then whisk it again every 10 minutes or so for about 30 minutes, putting it back into the freezer each time—or until it starts to firm up and look creamier." I'll check my scale but I think it's ok! Thanks for the note about it being too liquidy - that happened to me when I first tried Mattie's version. My cocoa butter was too hot. So now I melt it then let it cool to room temp (while still liquid) and blend then. It emulsifies very quickly and doesn't break with the heat of the blender. My latest was the same consistency of a vegan becel while my first batch was a bit harder than earth balance. I'm just so happy for your recipes! Even if my son outgrows all of the ingredients that are in earth balance, I will still make this from now on! It's awesome! Thanks for the info about the sugar! Do you know which mold was used for the photos? I like that size and want to produce the same! Lorelei, I just write to the photographer-- I'll let you know! Bryanna, I really like this butter. I just made zucchini bread with it, and it turned out awesome. I find that I like it better without the turmeric. Now I just need a palm oil free shortening recipe:) Thanks for all your hard work. There are a lot of people listening and following you. Bryanna - I cannot have regular cocoa butter. Do you know if the recipe can be made with non-dairy cocoa butter? Sara, I'm not sure what you mean by "regular cocoa butter"-- perhaps white chocolate? Real cocoa butter IS dairy-free; it's just the fat from cocoa beans. Please read above for where to buy and various types. I haven't tried it yet so can't vouch for the flavor, but I found an organic sunflower lecithin at http://www.mysunflowerlecithin.com/100-organic-liquid-sunflower-lecithin/#content. I don't believe the Love Raw Foods brand sunflower lecithen is organic even though it's sold by bluemountainorganics. Made this a couple of weeks ago for the first time, and it is THE BOMB. SO easy and the consistency and flavour are excellent - better than Earth Balance. Been messing around with different oils for different flavours since, because it's also so easy. Whew! - never using palm oil again! Just made this and find it is very soft. Spreadable straight from the freezer. Too soft to keep in fridge or leave out at room temperature. Your recipie has a way higher proportion of liquids, oil and soya milk to coconut oil than Matties recipie could this be the cause? I have made Matties recipie and it is too hard to spread straight from the freexer but just right at room temperature just like real butter. My recipe has more liquid oil in order to have less saturated fat and more polyunsaturates. However, the cocoa butter you use should be hard enough so that it almost shatters when you stick a knife in it. That is the type you must use, and it is hard enough to solidify quite alot of oil. The picture at the top of this page, by Christina Hoheisel shows my Buttah, obviously solid enough to cut. It stays this way at room temperature, and I have been making it for several years now. If your cocoa butter is soft, it's the wrong kind to use. Christina Hoheisel, BTW, made that buttah she photographed in her own kitchen. We have never met. She used the organic, fairtrade steam-deodorized cocoa butter that I always use, from Chocolate Alchemy in Oregon. Has anyone had luck trying to make this using flax milk? Also, is there another alternate to soy or sunflower lecithin to use? I'm trying to avoid allergens my son has. Thanks! Anonymous, any plant-based milk will work. I have never seen any other kinds of lecithin. Perhaps you could try leaving it out and using a bit more of the vegetable gum. I am wondering why you say the soy/almond milk should be "not unsweetened"? That means sweetened. Is that what is called for? Sweetened almond/soy milk? Just wanted clarification. Can't wait to try it! Anonymous, I use Silk Organic Original Soymilk, which has a bit of sugar in it, or my own homemade, which also has a bit of sugar init. That doesn't mean that it tastes "sweet". This type of soymilk actually contains about half as much sugar as dairy milk (that's what lactose is-- a sugar). Dairy milk contains 13 g of sugar per cup, but doesn't taste sweet-- the natural sugar is just part of the complex flavor of the milk. (Silk Original organic Soymilk contains 6 g sugar [organic evaporated cane] per cup.) A more balanced, complex, "milky" what I am going for and what we prefer. Unsweetened non-dairy milk tastes "flat" to me. BTW, using this milk in the "Buttah" recipe gives you 3 g of sugar in the whole "Buttah" recipe. You can try it and see what happens. It may be more like a tub version. Bryanna, I just made your buttah (using EVOO), and I love it! I have a couple questions. First (maybe a dumb one) -- OK to leave the salt out to use in recipes calling for unsalted butter? Second -- has anyone used this in a pie crust, and if so, what were the results? Bryanna, thank-you for all the work that went into this. It means a whole lot to those of us raised on dairy and trying to eliminate it. Although the buttah isn't cheap, it's of fantastic quality and I think maybe a little cheaper than store-bought vegan butter. It contains less cocoa butter, so is cheaper, AND it's unsalted. You also might like to try my new Butter-y Spread, which is sort of a tub version of my Buttah, but is easier to make, contains less cocoa butter and can also be used in butter, especially if frozen. The link no longer works for the recipe - I use this recipe all of the time and I just received a new year supply of cocoa butter - please please put up the recipe!! or - can anyone share it with me?!? Thank you so much for all the hard work you did to create this recipe -- I made a batch and am blown away by how easy and delicious it was, and by how well it performed in baking. I have tried so many butter alternatives since ditching palm oil several years ago -- most did not hold up as well in baking as the vegan margarine I was used to. But the search is now over. Thanks again! !